As I mentioned in my last post, I'm going to be linking up with Beth Anne again during Lent. She gives some great prompts that really make me want to write! Just what I need! I'm going to do a couple this week, I might not do one for every day of the weeks, I might pick and choose. This week, I couldn't decide so I decided to do multiple ones! 1. Ash Wednesday - So on Ash Wednesday this year, Christopher woke up coughing so hard that he was gagging. I knew that one of us would have to stay home with him, and Jason volunteered. 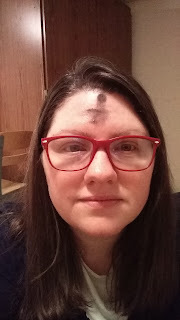 That meant that I got to focus more completely on the Mass and it was a lovely start to my Lenten season. 2. What are you doing for Lent? I went back and forth about whether or not to share what I'm giving up and promising to do, but in the end, I'm going to share just so I have a bit of accountability. So, something that I really struggle with is moderation. In food, this means that I often glut; eating past the feeling of fullness because I'm enjoying the food so much, and eating often. But I also lack moderation in other areas. If I start watching videos online of shows that I enjoy, I can easily get caught up in that and ignore most everything else. No, that doesn't mean the boys don't eat or get clean, but it has meant in the past that they also spend a lot of the day engaging in video stimulation instead of getting out and playing or playing inside. It has also meant that I've neglected some household duties. You might be thinking, well then, just don't watch videos-read a book, listen to a podcast, even an audio book. But, my lack of moderation extends there as well. So, for Lent this year I decided to give up some media consumption. I'm trying not to listen to new books, reading only at bedtime, no online videos (not even cooking ones boo hoo! ), and only one podcast episode at a given time. I'm also adding in spiritual reading throughout the week, and daily Mass. We've been attending daily Mass as a family since Jason went back to working at 8AM, but if he can't go for some reason I've been allowing myself the leisure of laziness. But not this Lent! I'm going to try to take the boys by myself...tomorrow is the first time this will happen, so say a prayer for me. I've also decided (a little late) to fast on Fridays. If you're wondering if my media fasting extends to social media, it does not. I find that I'm not so entranced by Twitter and G+ that I neglect other things. That seems to be a facebook specific problem, and as I'm not on facebook anymore, I don't have this struggle right now. Check out Beth Anne's site to see who else linked up, and join if you'd like! Thanks for joining! I'm awful at taking selfies..I'm often so focused on actually TAKING THE PHOTO that I forget to smile or look at the camera.